DeKalb County has seven of its 17 playoff teams in action tonight led by the No. 8 ranked Chamblee Lady Bulldogs who host North Springs at North DeKalb at 6:00 pm. Chamblee (12-2-2) rolled through its Region 5-5A schedule 7-0 and outscoring its region opponents 67-0. Juniors Teagan Furbish and Caiah Smith lead the charge for the Lady Bulldogs. Skye Bragan is the leader in goal for the defense. Chamblee is making its 10 consecutive state playoff appearance, but is looking to improve on its 3-9 record. It is the first playoff matchup between the Lady Bulldogs and North Springs (8-8-1). The Region 4-6A champions Tucker Lady Tigers (9-8-0) are also hosting as they take on Region 3 No. 4 seed Grovetown (5-7-2) at 5:30 pm at Hallford Stadium. Tucker also went undefeated in region play at 8-0 with a 63-3 margin on the scoreboard. Anna Lippy has 30 goals and 8 assists on the season to lead the Tucker offense. She is joined by Erica Bower with 15 goals and 6 assists while Anna Fernandez has 13 goals and 10 assists. Goalie Amanita Wai has over 1200 minutes in goal for the Lady Tigers. Tucker is 2-11 in 11 playoff appearances and is making a fifth consecutive foray into the playoffs after advancing to the Sweet 16 a year ago. It is the first meeting with Grovetown. Lakeside (12-3-2) travels to Rockdale County (13-3-0) for a first round battle in Class 7A girls’ action at 6:00 pm. The Lady Vikings are making their 18th consecutive playoff appearance and are 21-23 overall. The two teams met in the 2006 state playoffs with Lakeside coming out on top 4-1. Juniors Olivia Cohen (19 goals, 5 assist) and Lena Schaefer (11 goals, 5 assists) lead the Lady Vikings scoring while junior Taylor Malinovsky and senior Julia Moreman have split the 1200 minutes in goal and both allowed just 4 goals. Arabia Mountain (8-5-2) is making its third playoff appearance and second against No. 7 ranked Riverwood (12-5-0) in Class 5A girls’ first round state playoff action at 5:30 pm. Riverwood won the first meeting 8-0 in 2013 which was Arabia Mountain’s first ever playoff game. The Lady Rams are led by a youth movement including sophomores Kendall Franklin and Amber Bradshaw and freshman Jahniyah Phillips. Senior Tyra Redmond is the lead on defense as she dominated time in goal this season. Southwest DeKalb (12-5-1) is the other entry from DeKalb’s Region 5-5A girls’ kicking off play today as they travel up the road to No. 2 ranked Decatur (14-2-1). It is the first ever playoff meeting between the two DeKalb foes at they meet at 6:00 pm. 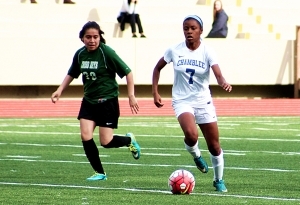 Georgiann Sinclair is leading DeKalb County with 41 goals on the season while contributing 11 assists and teammate Jaylah Williams has 17 goals and 16 assists on the year. Senior tender Kealynn Jackson has over 800 minutes in goal. In other Class 6A girls’ action, the Dunwoody Wildcats (8-7-2) return to the state playoffs after missing in 2017 which ended a seven-year run. Dunwoody goes on the road to face No. 8 ranked Apalachee (11-4-1) at 6:00 pm. 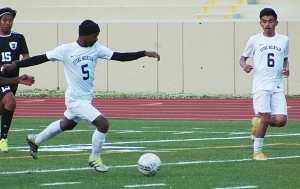 The only boys’ team in action today is the Chamblee Bulldogs (5-9-1) who travel to Riverwood (9-7-2) for a 7:30 pm match as part of a doubleheader with the Arabia Mountain and Riverwood girls. It is the first playoff meeting between the two teams. Chamblee is 18-12 overall including the 2018 Class 3A state title, but is looking to buck the trend of first round losses the past five seasons. Six teams are in action on Wednesday including boys’ teams from No. 1 ranked Cross Keys, No. 6 Clarkston, and Arabia Mountain in Class 5A. Tucker opens the Class 6A boys’ state playoffs while the Cross Keys’ (5A) and Redan (3A) girls also open their playoff runs. Druid Hills opens Class 4A girls’ play on Thursday on the road while the Red Devils host on Friday. The Stone Mountain and Towers boys’ open play on Friday in Class 3A action.